Children love imitating animals. Hal first teaches children how to crawl like different animals (e.g., monkey, bear, tiger and lizard), then teaches them how to stand and step like animals. 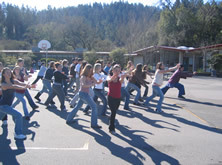 These movements are adapted from Chinese martial arts (going back hundreds of years) and continue to be taught to millions of children in Chinese and Taiwanese schools. 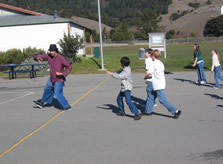 In Junior and High School movement classes, Hal introduces swinging sticks. Stickwork tests hand-eye coordination and their ability to perceive their bodies moving in space. Once they are competent with sticks, then open- hand movements are taught. 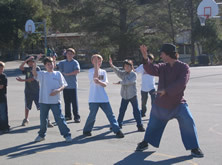 Hal can integrate into physical education classes or be part of an after-school program. Martial arts teacher for over 25 years. Learning Center permit for after School care.